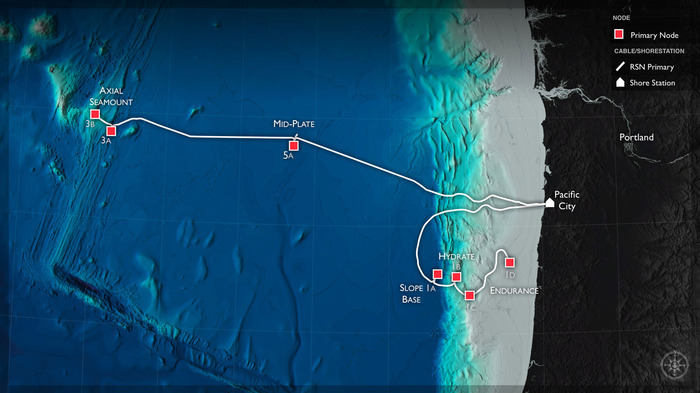 US-Australian team find surprises and complexity at Pacific ocean volcano site. A remotely operated vehicle (ROV) lands on the seafloor at Havre submarine volcano to retrieve a heat flow monitor. Woods Hole Oceanographic Institute. The first close quarters investigation of what was possibly the largest underwater volcanic eruption in modern history has uncovered a carpet of pumice rocks, some as big as motor vehicles, and unexpected ocean-bed lava flows. In a paper published in the journal Science Advances, a research team led by the University of Tasmania in Australia and the Woods Hole Oceanographic Institution (WHOI) in the US report on the use of two autonomous underwater vehicles to explore the aftermath of the eruption of the 2012 Harve volcano, which lies between New Zealand and American Samoa in the southwest Pacific Ocean. The volcano blew on July 18, 2012, an event noted only when passengers on an airliner flying above the Kermadec Islands (of which Harve is an underwater component) noticed a huge number of pumice rocks floating on the surface of the ocean. The raft of rocks eventually covered almost 400 square kilometres. Three years later, the joint Australian-US expedition headed to the blast site. “We knew it was a large-scale eruption, approximately equivalent to the biggest eruption we’ve seen on land in the Twentieth Century,” says Australian volcanologist Rebecca Carey, and co-chief scientist on the expedition. Carey and her colleagues suspected they would find evidence of a deep-sea explosive eruption – the commonest form of underwater volcanic activity – but what they discovered was different. Instead of the classic blast pattern associated with explosive eruptions, they saw an ocean floor littered with large lumps. So unusual was the find that at first co-author Adam Soule from WHOI thought something had gone wrong with the autonomous vehicles’ imaging system. Having gathered as much evidence as possible, the team concluded that the Harve volcano had undergone an underwater silicic eruption, characterised by the forceful emission of viscous, gas-filled lava. This made for an exciting find. Very little is known about silicic eruptions. They are extremely violent acts, but because they take place deep underwater in vast oceans they are very rarely recorded. Most of the current knowledge about their behaviour comes from geologic records rather than observation. Already, the team’s findings are adding considerably to the picture. The Harve eruption, they discovered, was a complex affair, with lava emerging from 14 vents, between 900 and 1220 metres below sea level. While explosive eruptions produce mainly pumice, this one also produced significant amounts of ash, lava flows and lava domes. Although an estimated 75% of the erupted material headed to the sea surface and eventually floated away, that which remained underwater was enough to spread across the ocean floor for several kilometres.